Hilton Head Island is one of those places that can inspire the mind to wander. From the ancient history of the first inhabitants, to the more recent history of it's rich and sometimes controversial characters, to the myriad of natural wonders and recreational activities of today. You can lose yourself for a week or a lifetime of weeks on the shores of this beautiful island. The Hilton Head "Destination" bracelet is a tribute to sun and fun as well as the history and culture of this Southern Lady. The "H" squared is a whimsical way of beginning the symbolism and it is finished with an "I" that resembles an anchor in tribute to the islands nautical heritage. The 12 wraps of 14 karat gold represent the 12 miles of lovely sandy beaches that feel so good between the toes. 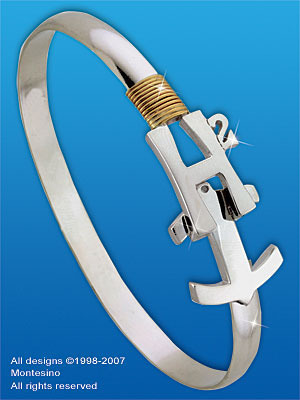 Show your island pride with the Hilton Head Island "Destination" bracelet, a symbolic treasure that will always endure.